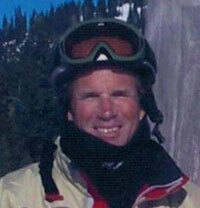 Steven Scott Holm unexpectedly departed this earth for the big powder run above the clouds on Saturday, Dec. 14, 2013. Remaining behind to continue skiing his favorite runs below the heavens are his wife of 25 years, Susan Holm; his two daughters, Patti Chatterton (Jim) and Becky Hylton; and his three sons, Robert Hylton, Zach Holm (Noelle), and Hobie Holm. He also leaves behind his mother, Juanita Brown; brother, Keith Holm; and two sisters, Linda Nacerillo and Peggy McCullen. Steve was born on Oct. 19, 1957, and spent the first part of his life in the Boise area. Seeking a new path in life, Steve eventually moved to the Wood River Valley, where he met and married the love of his life and his soul mate, Susan. Together they began the years of raising their children, though their passion for the outdoors and adventure would eventually take them to the McCall area. In 1999, Sue and Steve moved to the McCall area where they whole-heartedly pursued all the activities the wilderness there offered. He will be missed by his six grandchildren and numerous nieces and nephews, who knew him as “Stinky Skunk,” renowned for his “noogies” and playful wrestling skills. He can best be remembered in the sparkle of the snow on a bluebird day, in the ripples of a fish jumping, and in the spray of the wake behind the boat. Services will be held at McCall’s Heikkila Funeral Home today Friday, Dec. 20, at 1 p.m.